Senator Rand Paul (R-KY) blasted the Democratic Party on CNN for their obsession with testifying relations between the United States of America and Russia during President Trump's visit with Russian President Vladimir Putin, denouncing the behavior as “Trump Derangement Syndrome,” and firing shots at the entirety of the “Deep State” communism. Rand Paul is an American patriot who does not have a brittle bone in his body in terms of standing up for Christian and traditional values. He has forever remained a staunch defender of the Constitution and has a far-reaching base of support. But with his recent words about the Democratic Party, he's guaranteed to make new enemies. Wolf Blitzer stood in his robotic, trance-like state, and attempted to interrupt Rand Paul saying, <i>“But… But Senator…”</i> and the Kentucky Constitutionalist was having none of it. Rand Paul finished, <i>“All of that is being lost,”<i> insinuating that because of the hatred for Trump from the Democrats, the liberal mindset would rather start a war with a nuclear power than seek out peace and unity with our Christian allies in Russia. Rand Paul is spot on. To this day we've seen zero evidence of “collusion,” from any American citizen during the 2016 elections with any foreign power, and we've still not been provided any evidence to show the American people that Russia engaged the United States of America to “meddle” in our elections. The American people do not trust the intelligence community, albeit we know President Trump has desperately sought to restore the integrity of the Federal Bureau of Investigation and the Central Intelligence Agency, as well as the Department of Justice; despite staunch resistance from crooks like Rod Rosenstein. To date, we still have no idea where DNC server, which was allegedly hacked, has been transported to because the FBI claims they don't have it. The mockingbird mainstream media has been freaking out about President Trump mentioning the missing DNC server, with propagandist outlets like Gizmodo running a story titled,<a href="https://gizmodo.com/trump-is-still-rambling-about-a-dumb-theory-that-the-dn-1827645243"> “Trump Is Still Rambling About a Dumb Theory That the DNC Is Hiding an Incriminating Server,” </a>showing you how they're attempting to spin the narrative. If you read that correctly, you heard Wolf Blitzer crybaby tone when he said it. Let's interrupt Wolf Blitzer momentarily to show him what <i>other Presidents</i> say when they meet with Vladimir Putin or Russian officials, especially Barack Hussein Obama, right before he forced American agencies to back a deal that forever damages our National Security, and put hundreds of millions of dollars into the pockets of Hillary Rodham Clinton. President Obama and outgoing Russian President Medvedev were caught in a hot mic discussing their backdoor dealings, of which many have speculated have different meanings. “This is my last election, after my election I have more flexibility,” Obama was caught promising the Russian President. “I understand. I will transmit this information to Vladimir and I stand with you,” Dmitry Anatolyevich Medvedev said during his last meeting with Barack Obama before Vladimir Putin took back the helm of the Russian Presidency. So what, exactly, is Wolf Blitzer talking about when he claims President Trump somehow stepped away from the “normal” approach to the Russians Obama would have made? Oh, I think I get it, I know what Wolf Blitzer meant. Is that the difference, Wolf Blitzer, is that why you're upset? Rand Paul was correct in mentioning Trump Derangement Syndrome, a very real medical condition, but he may have been preaching it to the wrong choir since Wolf Blitzer himself seemingly suffers from the condition. The Goldwater has reported on this, when<a href="https://thegoldwater.com/news/26827-Obama-Stooge-James-Clapper-Argues-He-Was-Thinking-Something-Else-When-Lying-Under-Oath"> James Clapper did, in fact, commit perjury </a>once prior, and he has a history of making idiotic statements. If there were justice in America, Clapper would be in prison. He may be one day, assuming he's on a list with many others inside sealed indictments. Wolf Blitzer becomes triggered at this point, with his face reddening to the maximum, knowing that his “Deep State” handlers won't be pleased if he allows the truth to air on CNN's networks, so he interrupts. For those unaware, Dan Coats is the Director of National Intelligence under President Trump. This is an amazing exchange of dialogue between the “Deep State” and an American patriot, and if you had any doubts as to whether they're panicking right now, you should watch Rand Paul's annihilation of Wolf Blitzer. <i>“It's Dan Coats and Mike Pompeo,”</i> Blitzer repeats the words he's being directed to say in his earpiece, like a good drone. Certainly, he'll have his robotic parts oiled and shined after the show. <i>”It does matter <b>who</b> was in charge of the intelligence. It does matter because they started, and ginned up this whole thing, saying and having gone after the President saying that he's committed ‘collusion’ with Russia,”</i> Rand Paul says denouncing the Democratic Party’s bastion of deception. <i>”James Clapper, who lied to the Senate. He said they [NSA/CIA] weren't collecting our information, and yet they were collecting our information and housing it in Utah, John Brennan…”</i> Rand Paul says as Wolf Blitzer again becomes triggered that the “Deep State” is being outed by the heroic Rand Paul, and tries to interrupt. <i>”These are the people who had the power to collect every American’s information, and these are the people who I am concerned used their bias against President Trump. The intelligence community is full of biased people including Peter Strzok, Andrew McCabe, and dozens of others,”</i> Rand Paul concluded. The interview was fiery, and one of the reasons I've previously supported Rand Paul and Ron Paul in their endeavors and desires to end the “Deep State” control over the American populace. Rand Paul, who sometimes clashed with Trump appointments, because it goes against his values, <i>deserves the full respect of the American people always,</i> because he <i>never compromises on those values</i> which he holds dear to his heart… just like his father before him. For those unaware, Ron Paul exposed the drug trafficking of the “Deep State” during the Reagan Administration at the behest of then-Vice President George Herbert Walker Bush, who once led the Central Intelligence Agency and is tied to the Mesa, Arizona Communist training camps of the Colombians during the Pablo Escobar cocaine reign. This is a family of fighters, who hold their values above politics, and would be critical allies in any effort to defeating the “Deep State,” once and for all. 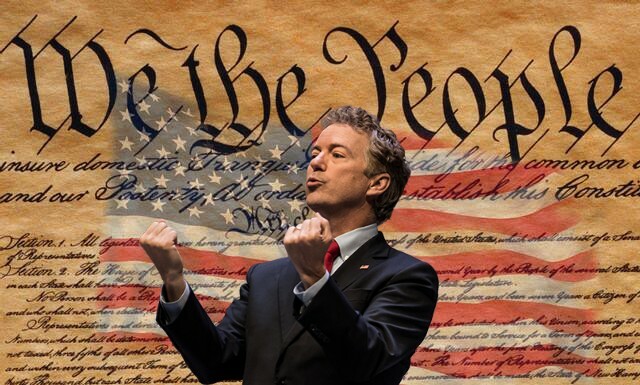 President Trump <i>needs allies like Rand Paul right now</i>, who aren't simply “yes men,” but stand up for what's right against what is terribly wrong with America. You can't help but love when Rand Paul takes to the microphone, because you're always in for a treat. This is why the overly expensive and unpopular witch hunt against the 45th President of the United States of America has to end. Contact your elected officials and tell them to end the madness once and for all.